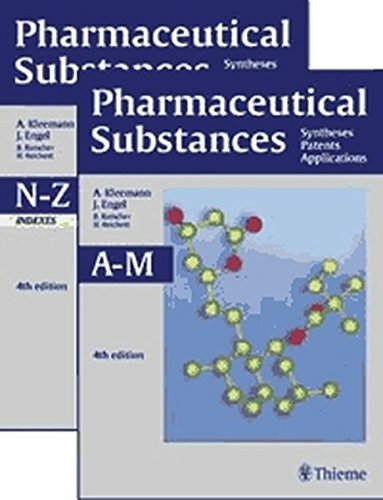 Pharmaceutical Substances is the newly revised and expanded edition of "Pharmazeutische Wirkstoffe" in English, covering over 2,100 pharmaceutical compounds of interest to the chemical and pharmaceutical industry. Available in print and CD-ROM, Pharmaceutical Substances is designed to be a complete reference guide to every pharmaceutical compound of significance. It is essential as a first point of reference not only for specialists in drug chemistry but also for anyone involved in the synthesis or use of pharmaceuticals. All compounds are organized alphabetically according to INN standard, for added ease of use the book features three additional indexes: Intermediates Enzymes, Microorganisms, Plants and Animal Tissues Substance Classes The CD-ROM will allow field, full text and index searching. It includes a browse function to allow you to peruse the data alphabetically by INN. It will be updated annually with 50 to 100 new compounds added each year.